As many of you already know, I was born in Colombia where I also spent most of my childhood, so it’s no surprise that I had never heard of sabajón until a few years ago when one of my friends mentioned it in one of our conversations. 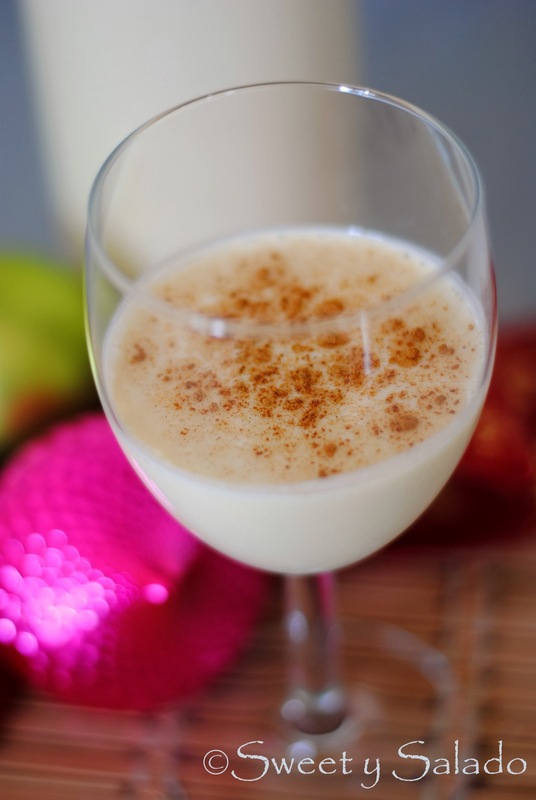 Sabajón is the Colombian version of what most of us know here in the US as “eggnog” but it contains either white rum or Colombian aguardiente. Aguardiente literally translates to “burning water” or “fire water”, and it is an anise flavored liqueur made with sugar cane. So why is it called “burning water”? Simply because it is STRONG, which is the reason I prefer to make my sabajón with white rum. 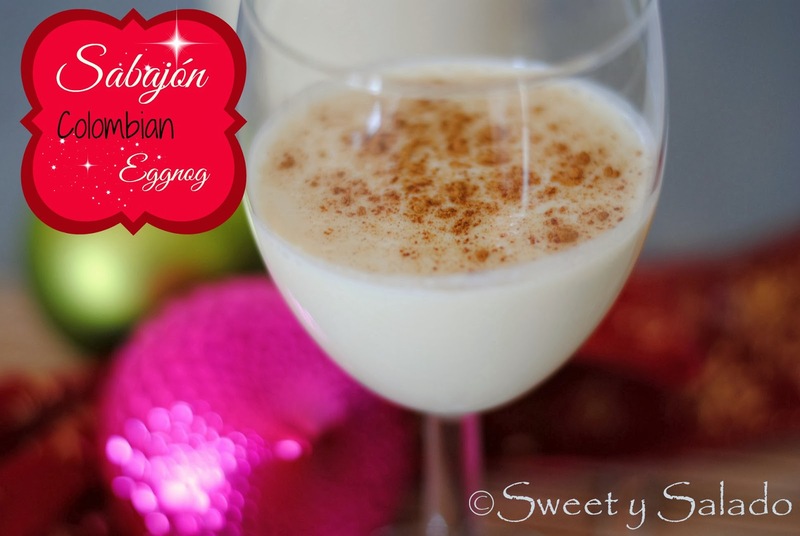 Besides the use of aguardiente, the difference between the eggnog recipes I have made over the years and sabajón is that in Colombia it is made with not only egg yolks but also sweetened condensed milk. The first time I made it I wasn’t sure if it was going to be thick or smooth enough but let me tell you, the condensed milk really makes a difference and it is soooooo good! So, if you want to add one more Christmas Colombian recipe to your holidays, make sure you add this sabajón recipe to your list. Serve it cold along with some hojuelas, buñuelos, natilla, empanadas or tamales. I’m sure your guests will love it! 1. Add the milk, sugar and cinnamon sticks to a large pot and bring to a simmer at medium low heat. 2. In the meantime, beat egg yolks and condensed milk in a medium bowl. 3. Once the milk begins to simmer, add a few tablespoons of the hot milk to the egg yolk mixture and stir well to temper it. Then, add it to the hot milk and stir again. Cook on medium low heat, stirring occasionally for about 10 minutes or until it thickens. **Note: Tempering the egg mixture before adding it to the hot milk will prevent the egg yolks from cooking and turning into scrambled eggs. 4. After 10 minutes, remove the pot from the stove, remove the cinnamon sticks and strain the eggnog through a sieve into a large bowl. This will remove any clumps or cinnamon pieces that may be left in the mixture. Let it cool completely. 5. Once cooled, add the rum or aguardiente and the vanilla, stir well and refrigerate, preferibly overnight before serving. Serve chilled and decorate with some ground cinnamon on top, if desired. Thank you so much for this recipe! Found you on YouTube, searching for eggnog recipes, and got intrigued by this! I'm from Sweden and have no connection at all to Colombia, but this sounds soo good. First time making eggnog so why not go big? 🙂 Much love from Sweden!